FOXBusiness.com’s Kate Rogers on Target failing to properly activate some gift cards sold this holiday season, just over a week after a massive data breach was uncovered at the retailer. Target (NYSE:TGT) is likely more than ready to ring in 2014. Less than two weeks after the retail giant suffered a massive data breach, which impacted an estimated 40 million customers who shopped with debit and credit cards in its U.S. stores, Target has confirmed an issue with gift cards sold during the holiday season. Thousands of gift cards were reportedly not activated properly. 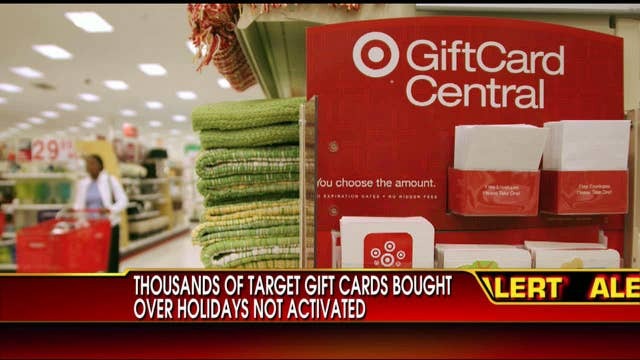 Target cashiers apparently scanned the wrong code on the cards leaving them void, according to FOXNews.com. A Target spokesperson says the media reports have highly inflated the numbers. The issue is that this is the same number that those impacted by the data breach have also been instructed to call, and is swamped with concerned customers, FOX News reports. Shoppers impacted by the breach are those who shopped between Nov. 27 and Dec. 15, at the height of the holiday shopping season. Customers in California and Oregon have already filed class-action suits against Target for the breach, but it remains to be seen just how much of a black eye the retailer will take from this latest flub.